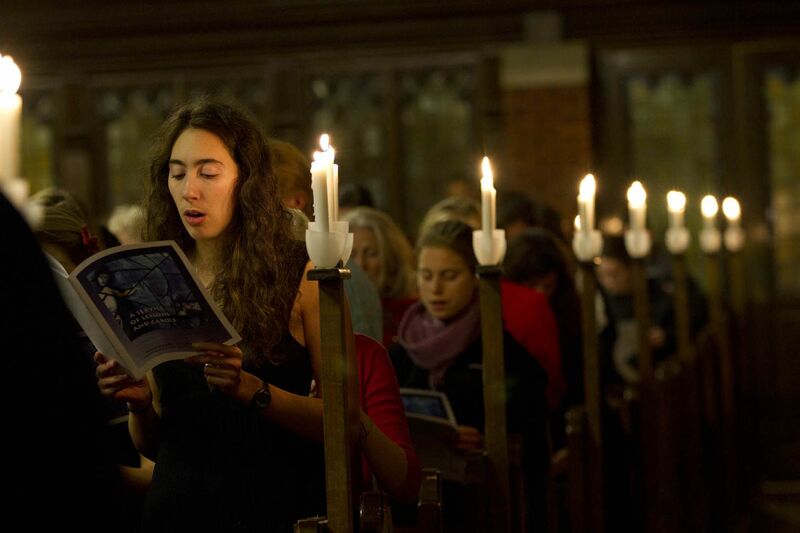 In an annual tradition at Bates College, a Service of Lessons and Carols for the Advent season of the Christian faith will be held at 7 p.m. Sunday, Dec. 13, in the Peter J. Gomes Chapel, 275 College St.
Bates’ Service of Lessons and Carols draws on the traditional structure of the Festival of Nine Lessons and Carols, telling the story of the birth of Jesus through traditional scriptural readings mixed with contemporary prose readings. This year’s readers include Jamil Drake, visiting assistant professor of religious studies; students and members of the college staff; and college President Clayton Spencer. Music will be provided by keyboardist and Lecturer in Music John Corrie; the College Choir, directed by Corrie; and a cappella singing groups the Crosstones, the Deansmen, the Manic Optimists, the Merimanders and TakeNote. The Rev. Brittany Longsdorf and the Rev. Raymond Clothier, respectively the multifaith chaplain and acting associate multifaith chaplain at Bates, will offer blessings.